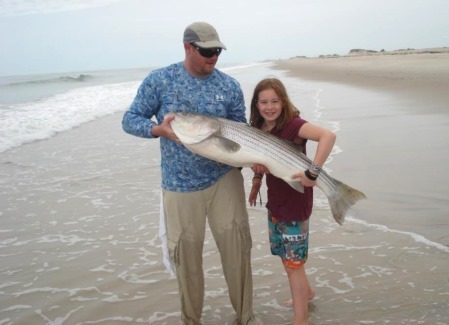 This 45 inch Striper was landed by young Skylar (assisted by dad) on a 13 ft. 3-6oz. Factory Built Custom Rod. Use the Product Category links below, or on the upper left, to find the equipment you need to catch the big one! 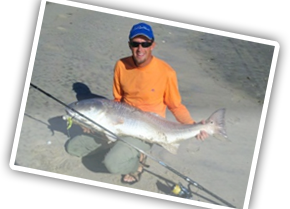 Check out our photo gallery to see huge fish caught in North Carolina and around the world, using our gear. Reach the fish beyond that second bar, you know the one, and reach a trophy catch using equipment that has proven to land the big fish. We have the surf fishing gear you need to turn a good fishing day into a great fishing experience! Carolina Cast Pro T-Shirts - Show your enthusiasm with a quality T-Shirt. Logo on the back, great for the beach! !